Cats win!!! Good night all!!! Winning is always good. 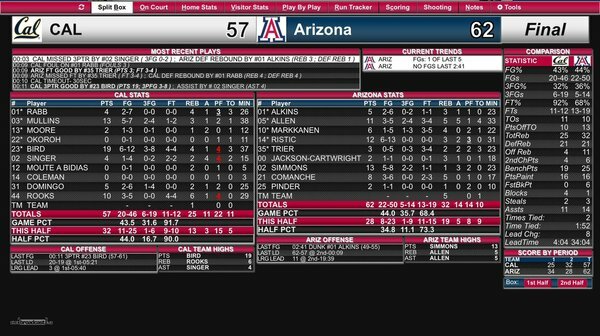 I'll take ugly any game that ends with a W.
FINAL: Arizona 62, California 57. Arizona is 12-1 in conference. Winning any which way is a good thing! Allen needs to do a better job with ball control. Needs to use his head on offense. Bill Walton is drunk right? Trier gets fouled with 9 seconds left. Cal is down four with 10 seconds left. Arizona has the ball though. Cal takes a timeout here. Arizona leads 61-57 with 10.7 seconds left. Jabari Bird hits the 3! Arizona takes a timeout here. The Cats lead 61-54 with 17.7 seconds left. Trier scored his first points with 17.7 seconds left. On free throws. Trier just made his first point of the game. There's 17 seconds left. WOW! Trier might get his first points of the game here. Alone in 1st place in the PAC 12. I'll take it and enjoy it. Chance making the most of his playing time! Kadeem misses the first but makes the second. Kadeem gets fouled and now he'll shoot two. Walton should not be allowed to do games. Period. Walton is saying the same things folks here have been saying ... I'll call it team chemistry though .. hasn't come back together yet. Chance grabs the rebound and gets fouled. He'll go to the line. Cal takes a timeout here. Arizona leads 57-51 with 1:02 left to play. Lauri Markkanen not the offensive force he normally is but just bodied Ivan Rabb to force a bad shot with just over a minute left. Big play.